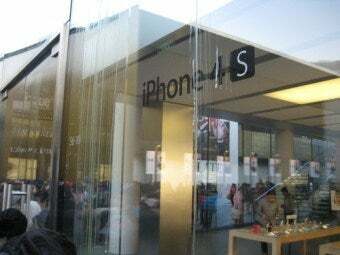 Apple abruptly canceled first-day sales of its iPhone 4S at one of its Beijing stores, prompting an irate customer to throw eggs at the building, and leaving others disappointed after waiting for a number of hours. "People have been waiting the whole night," said a 25-year-old who would only disclose his surname Zhang. "Apple didn't do a good job of preparing this." More than 300 customers waited on Friday morning outside the Apple store in Beijing's Sanlitun district, hoping to buy an iPhone 4S on its first day of sales in the country. But there was little semblance of an actual line. Instead, a large crowd of people had circled around the store as they waited in the freezing cold. Doors to the store remained closed in the minutes after 7 a.m. local time, when Apple had said sales would begin. At about 7:15 a.m., a security guard announced to the crowd that Apple was canceling its iPhone 4S sales at the store for the day, without giving a reason. Many of the customers, however, continued to wait. Eventually some chanted that Apple was a "liar" for canceling the sale. One customer then announced he had brought a bag of eggs, and began throwing them at the store's glass exterior. This led to a scuffle between the customer and security guards, who were then forced to run off as they were chased by a group of customers. Apple could not be immediately reached for comment. Chinese media reported that Beijing's other Apple store at Xidan Joy City had opened and was selling the iPhone 4S. The store had, however, sold out the phone within two hours of opening its doors, according to an Apple employee there. He did not know when the store would have more in stock. Apple's only official carrier in the country, China Unicom, said its site to accept online sales for the iPhone 4S had temporarily shut down after too many visits. 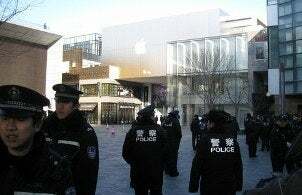 At about 8:40 a.m., a large group of police came to the Apple store at Sanlitun to quarantine the area to prevent others from entering the store's vicinity. Police then announced the store would not open in an effort to try to get the line of customers to disperse. By noon, the store was still closed. Zhao Wei, a 20-year-old who was waiting in line, said he was disappointed with the cancellation. "I think Apple had stopped the sales because there were too many scalpers waiting to buy," he said. "If I can't buy it today, that's OK. I will just come back and buy it," he added. Gang Tieyan, who waited in line since 5 a.m., said Apple treated its customers poorly by not even stating why the sales were canceled. "The consumers have endured a lot, waiting outside in the cold for so long," he said. "I feel it's not fair." Gang, however, still plans to buy an iPhone 4S, and said he will wait in line again if need be. "This is my first time deciding to come out here and wait in line to buy an iPhone. It was supposed to be a good day," he said. "But I'm very disappointed." This isn't the first time sales at Apple's Sanlitun store in Beijing have become disorderly. Last year, customers shattered the glass door to the store following a skirmish with security guards outside the store.